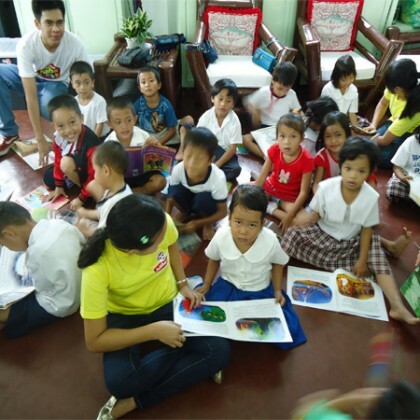 The Jollibee Mobile Library is a Corporate Social Responsibility (CSR) Program of Jollibee Iligan launched in 2011. In its launching year, it has accommodated a total of six schools all over Iligan. Today, the program continues to grow as it was able to add up three more schools for the year, making it a total of 9 schools visited. Interactive games and quizzes– bring the fun while learning. Learning Values through Fun– bring Jollibee and friends to teach kids values and proper manners. This 2012, Jollibee visited 9 schools here in iligan city and these are Victor G. Guevara Memorial School, Bagong Silang Elementary School, Francisco Laya Memorial School, Del Carmen Integrated School, Tipanoy Elementary School, Doña Josefa Celdran Memorial School, Villaverde Elementary School, Luinab Elementary School & Acmac Elementary School . It was a pleasure for Jollibee Iligan to help the kids on each school in valuing education. The Jollibee Mobile Library would never be complete without a visit from our friend, Jollibee. During the closing program, students were very excited and happy that they were given a chance to play, hug and have pictures with Jollibee. This is also Jollibee’s way of saying “Thank You” for the priceless and unforgettable experience shared by the students and the volunteers as well.